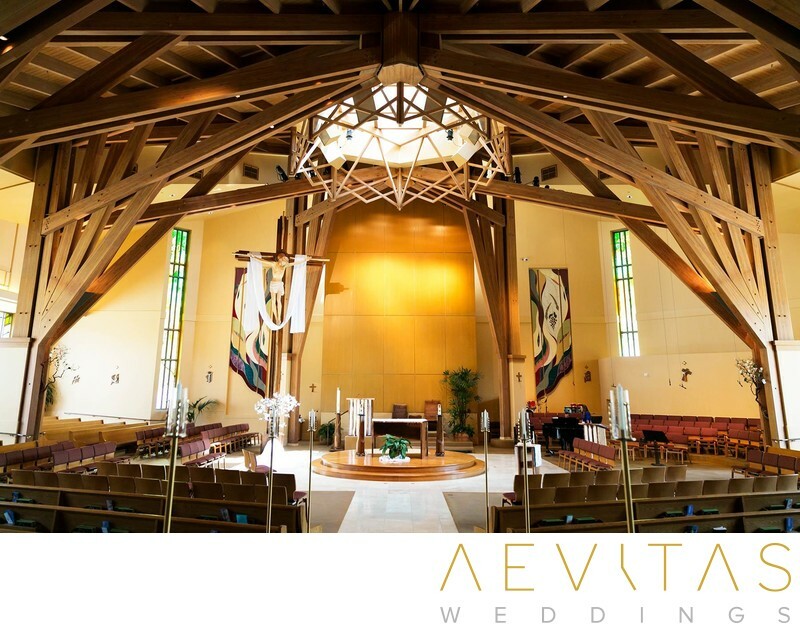 Located in the heart of Westlake Village, Saint Maximilian Kolbe Catholic Church is a popular wedding ceremony venue for couples of the Catholic faith. It combines traditional religious decor with modern architectural elements, creating a light and spacious house of God that retains its faithful ambiance. Walk down its wide marble-floored aisle, flanked by contemporary-styled pews, while rich wooden beams frame the ceiling above. You can personalize the ceremony with floral features and draping along the aisle edges, or add a wreath to the altar to give your wedding photos a dash of color. While many churches are noticeably dark, making wedding photography more challenging, the expansive windows of Saint Maximilian Kolbe Catholic Church allow plenty of natural light to flow into the space, creating warm and luminous images. Rich up lighting also adds depth to the walls, while a chandelier-inspired wooden lamp radiates from above. From taking communion to offering flowers to Mother Mary, Saint Maximilian Kolbe Catholic Church is the perfect setting to complete your traditional Catholic rites and rituals, watched on by family and friends. In keeping with its contemporary setting and approach, Saint Maximilian Kolbe Catholic Church allows your wedding photographer flexible access, enabling them to capture up-close portraits, expressions and reactions throughout the ceremony. The wedding photos that result will be distinctively unique, taken from creative perspectives and capturing every detail of your special day. At the end of your ceremony, allow time for couple portraits, bridal party portraits and family formals in front of the altar, then step outside into the leafy courtyard to incorporate some natural greenery into your wedding photos. Saint Maximilian Kolbe Catholic Church requires 6 months notice for wedding ceremony bookings, and their staff will be on hand to help organize your rehearsal times and guide you through the traditional Catholic wedding procedures.